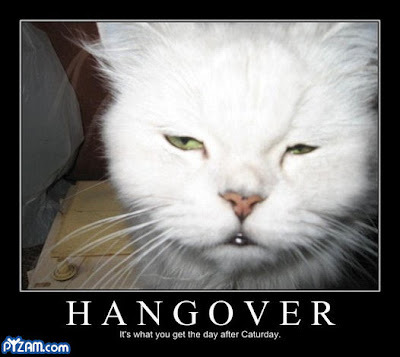 All sorts of people swear by their perfect cure for a hangover. I had a killer one today, brought about by an evening that was both enjoyable and stressful. I rarely have a bad hangover, but today was different. I spent almost all day in bed, hiding from daylight and noise. Unfortunately, I had made plans to go out with friends tonight so I had to get rid of that pounding head and queasy stomach FAST. I'd take the massage even if I don't have a hangover. I've only had one in my life and it was to die for. Having someone come to your house costs an arm and leg here and going to someone isn't cheap either. Ah, well, maybe some day I can get another one or convince Hubby that it's a great idea if he gives me one. hubby gives a great 30-sec massage; that's when his hands start to hurt. lol. D, seriously, come over here and you can get a home massage for $5 an hour! I think I've tried them all. The winner for me is Engov. Maybe not for you, but I will stick to Engov. It just works, is cheap und easy to use. One tablet with the first drink, one with the last. When I wake up, I feel fit enought o go jogging! That's true! You can buy Engov in any Pharmacy in Brazil or online. I really recommend it.